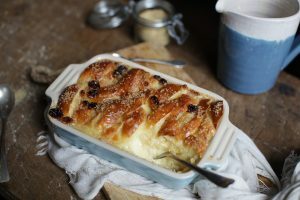 Puddings galore feature on April’s set menu with this divine brioche bread and butter pudding served with double cream one of our all-time favourites. Chocolate and walnut sponge with vanilla anglaise is a close second! Of course, our deliciously seasonal set menu is not all about puddings and this month you will also find a light and refreshing fennel and tomato salad with citrus dressing to start amongst other mouth-watering starters. Follow with pan-fried flounder served with pea purée and minted new potatoes and you will certainly find room for pudding!